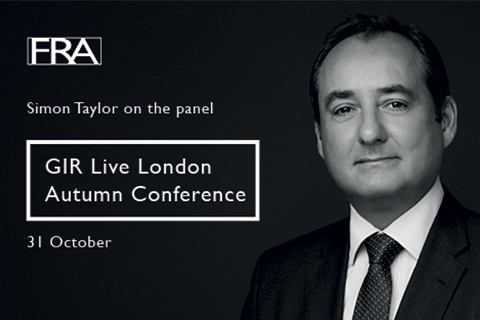 FRA are proud to have sponsored GIR’s Live London Autumn Conference in London this year. FRA Director Simon Taylor was on the panel The future of enforcement in the UK: is the SFO now properly equipped to meet the UK’s enforcement needs and what should the priorities be for its next Director? Alongside Simon on the panel were Jo Rickards, Mishcon de Reya, Brian Spiro, Herbert Smith Freehills, Matthew Cowie, Dechert and David Green, Serious Fraud Office. Following the DPAs with Rolls Royce, Tesco and Standard Bank, the SFO is taken seriously around the world. Is the SFO’s future now secure or is there a better model than the one currently in place? Should the SFO be judged on its revenue generation or by some other measure? – More DPA’s are expected to be concluded before David Green leaves the Serious Fraud Office in April next year. – SFO using Artificial Intelligence extensively for document review. – Voluntary self-report is still a requirement for a DPA. Nobody should treat the Rolls-Royce DPA as signifying that a self-report is no longer needed to qualify for a DPA. – David Green, SFO, said there is no issue with resources at the SFO for big cases – team of 90 was on Libor and 40+ on Rolls-Royce. Case teams were bigger than the DOJ had and he has never been refused funding. David Green said he could not understand remarks made about the SFO lacking resource. – Although there are now strong cooperation links between the SFO and key global prosecutors: e.g. DOJ, Singapore, Hong Kong. David Green denied rumours of a “Whatsapp” group for DOJ/SFO cooperation. – David Green did not discount the possibility of resolution corporate settlements via civil recovery in the right cases. – The SFO remains interested in facilitation payments – small payments, if they are repeated and sustained, they will be pursued vigorously. – David Green favours the introduction of a corporate offence of “failure to prevent economic crime” to compliment failing to prevent bribery and failing to prevent tax evasion. Read more about the GIR Live London panel discussion.